Below is a post that I have mulled over for a while. I'm not satisfied with it but I would love some feedback. I'd like to address two areas that are often considered taboo in the Agile field; Accountability and commitment. Just like the pig in the "Chicken and Pig Make Breakfast" story, agile teams make commitments. Teams commit to stories and they commit to estimates. 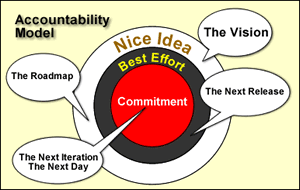 As an agile project progresses through the 5 Levels of Planning it also moves through progressively higher levels of accountability; Nice Idea, Best Effort and Commitment. The Accountability Model above is meant to illustrate how each level of planning helps the team zero in on an actual commitment. Since agile teams accept that requirements will change, the most detailed design estimates are held off until just before implementation. So, project stakeholders can expect The Release Plan to be more accurate than The Road Map and the Iteration Plan to be more accurate than the Release Plan. The Vision and the Project Road Map serve as guidelines for prioritizing during the more detailed planning that takes place closer to the Iteration. As new requirements and unforeseen changes expose themselves The Vision and The Road Map WILL change. Management should shy away from holding anyone accountable for changes that occur in the Nice Idea level. Rather, they should embrace the change as nessecary or find ways to mitigate the change. The Release Plan is a best effort estimate based on yesterday's weather. Iterations are timeboxed and most teams track velocity. This allows a project manager to produce an iteration schedule. The Release Plan, while more accurate than the Road Map, is less accurate at the front-end than at the back-end. For this reason, managers should consider using a confidence range chart or some other measurement of accuracy. Tracking a project's rate of change can also help mitigate risk. Managers should encourage change in the early iterations of a release but changes should stay within the scope of the current vision and roadmap. If you see either the vision or the roadmap changing you should consider wrapping up the release and starting a new release plan. Iterations are short and easily estimated. Teams with a well established velocity and a long history with the current project will be able to make the most reliable estimates. These teams should be able to fully commit to an Iteration of work. Accountability is a hard subject to address in this field. A person can "be" accountable, "be held" accountable or account for someone else. In general, developers are accountable to the user, the team and themselves. Holding a team accountable for the completion of a project is usually a huge morale killer and often does more harm than good. Holding someone (coach, scrummaster, etc) accountable on behalf of the team will most likely fail as well. So who is accountable? How is accountability expressed on an agile project? On agile projects, developers hold themselves accountable. They hold themselves accountable to the team, the users, their pair partner, themselves, etc. For Agile teams to be successful a culture of accountability must be nurtured but not forced. Nurturing a culture of accountability is easier said than done, but it can be done. The usual tools of evaluations, reviews and threats have no place on a self organizing team. You can apply incentives, a sense of accomplishment, team ownership and a little peer pressure. A good incentive suggested by Scrum is a burn down chart. On some teams the build server plays music or turns a light green when a build passes all tests. Involving the "Whole Team" in the planning and design is a surefire way of building team ownership. This leads to buy-in and allows developers feel a real sense of accomplishment. Also, large information radiators are a good way to keep the team focus. So, what I'm suggesting is that teams should want to commit to an estimate. Teams who have "bought-in" to a project are more likely to hold themselves accountable. Kent's discussion about accountability was my original inspiration for this. Memcached for Monorail (MfM) is my attempt at a simple, memcached/enyim based, session and caching facility for Monorail. MfM offers a lightweight, fast, low friction, facility for balancing Monorail sessionstate and object caches accross multiple servers. You can read my original post. Memcached offers an excellent solution for applications that need to balance object caches across multiple servers. It does so without the overhead of a database or even the use of the hard disk. Although, a major pitfall for memcached is it's unreliable nature. If a server in your memcached cluster fails then you lose all the objects cached on it. Memcached is just not meant for persisting object data permanently. The current release of MfM is capable of persisting sessionstate to a memcached cluster. If one or more memcached servers fails then that part of the session will be lost, permanently. For my projects, I found this unacceptable. I decided to add a DB persistence layer using ActiveRecord. delete the object stored on the Memcached Cluster. write the value to the Memcached Cluster. I imagine I will want to implement some kind of locking. To learn more check out the project website. You can also browse the source repository or checkout the code yourself.